HOUSEHOLDERS in South Tyneside are being urged to do more to beat burglars. 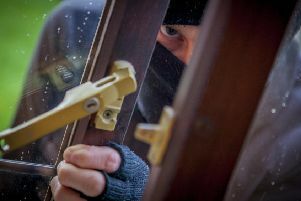 The warning comes from police who say that, since the start of April, 16 homes have been burgled in South Tyneside and after doors or windows were left open. Five of the burglaries happened overnight. Police are reminding residents simple crime prevention steps can help prevent them from being a victim of a burglary, in particular during the spring and summer months when they are more likely to leave doors and windows open as more time is spent outside. Chief Inspector Jerry Pearson, said: “People tend to spend more time outside during the spring and summer months and it can often be tempting to leave a door unlocked to make going in and out of the house easier, or leave a window open to let in some fresh air. “But it also makes it easier for thieves to get into the property. “Leaving a door unlocked or a window open, particularly overnight, is an open invitation to burglars. They see it is an easy opportunity to get in and see if there is anything they can steal. “We want local residents to feel safe and we are actively targeting those who we suspect of being involved in burglaries. Northumbria Police and Crime Commissioner Vera Baird said: “I’m determined that Northumbria Police continue to do all they can to tackle burglaries.